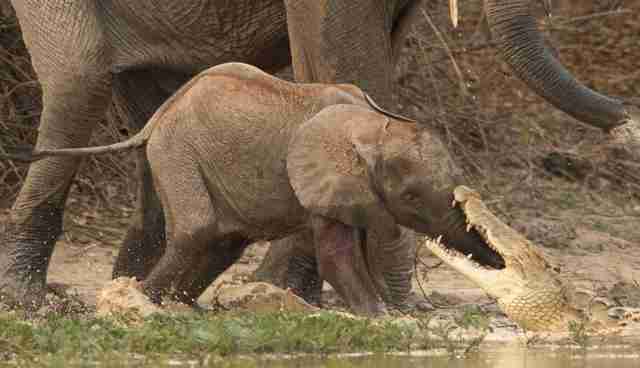 A baby elephant recently had a very close escape from a hungry crocodile. 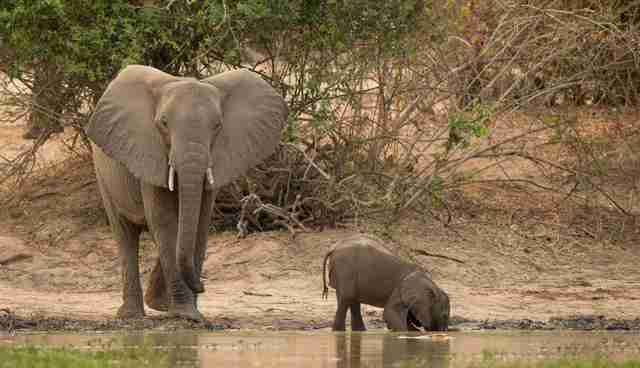 Zimbabwean farmer Francois Borman, who photographed the incident in October, said the thirsty calf had run up to the water for a drink as the rest of his herd trailed behind him. "He ran straight in and flopped down into the shallow, muddy water, rolling and splashing about," Borman said. "It didn't have a worry in the world." Because the calf was so young, he didn't know how to use his trunk yet and thrust his whole face in the water to drink with his mouth - making him the perfect target for a waiting crocodile. ... and quickly found himself in the mouth of a hungry crocodile. "The little calf let out a blood-curdling scream and started a tug of war for his life with the crocodile," Borman said. 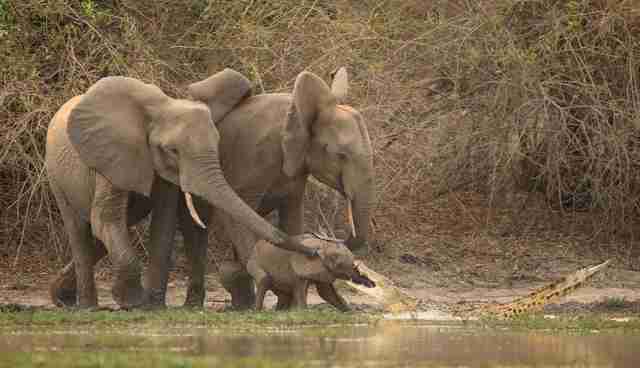 The adult elephants rushed to the calf's side, trumpeting and snorting, while the panicked calf nearly pulled the crocodile out of the water. Perhaps seeing the charging elephants, the croc decided to let go of the struggling baby's trunk and set off to find an easier meal. 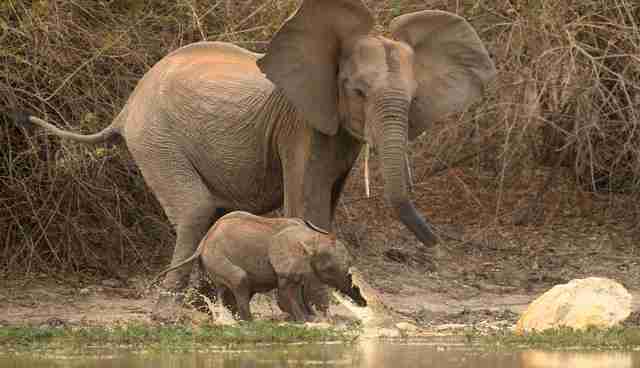 The world can be a scary place for little elephants, so it's little wonder elephant moms are so protective. Fortunately for the elephants - though unfortunately for the crocodile - this little guy got a second chance. And he reportedly made good use of it. Borman said he went right back to playing after the scary incident was over. 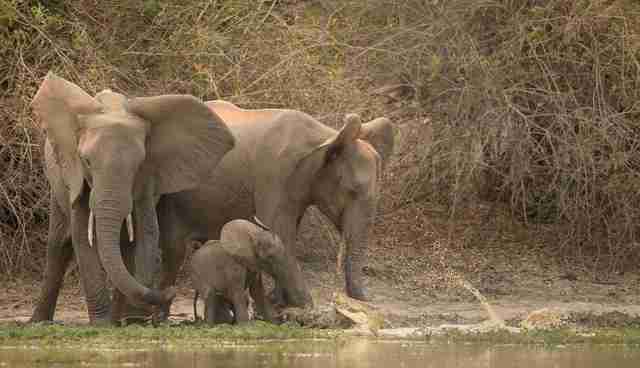 Sadly, many baby elephants don't have moms to look out for them. If you'd like to help, you can make a donation to the David Sheldrick Wildlife Trust, which cares for orphaned elephant calves and injured adults while working toward conservation goals.